You would be hard put to find another place offering so much charm in such a small space. Holašovice, situated in the middle of the harmonious landscape of Southern Bohemia, is surely the most charming village in the whole of the Czech Republic. The pride of this place is the wonderful Baroque farms set around the extensive village green, which even ensured inclusion of Holašovice in the UNESCO world heritage list. Holašovice is a tiny village of 67 houses. Unbelievably, this number has not changed in all its 800-year-long history. The village has 17 farms with barns and stables, blacksmiths, two taverns and a small chapel all in their original state, in the so-called Rural Baroque style of the late 19th century. Gaily coloured gables began to bloom on what was originally a simple medieval village, crafted down to the very last detail, which people come from all over the world to admire. 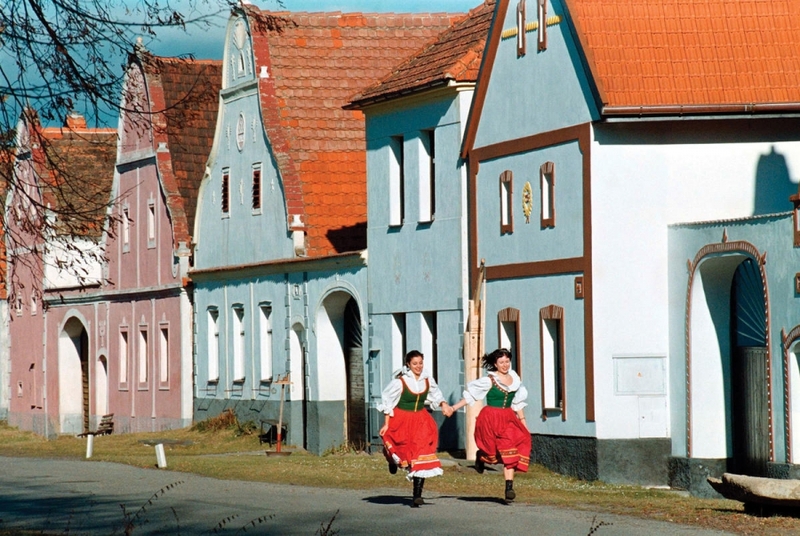 Holašovice has been on the UNESCO World Heritage list since 1995, no doubt thanks to the fact that the village is a living, rather than conserved, community. There are 140 inhabitants and most of the houses are under private ownership. The village is far from main roads and trails, which adds to the peaceful atmosphere. The village keeps its original appearance from 19th century. It is not an open-air museum, since most of the houses are inhabited permanently. It is considered the most charming village in the Czech Republic. For those inclined towards the spiritual and mysterious, the “Stonehenge of Holašovice” is a must-see. This huge Celtic stone circle, measuring 30 metres across, was built in 2008. The enormous stones were put in place under the supervision of known parapsychologist, Mr. Kozak. The monument is believed to have an energy that can positively affect a wide spectrum of pathological diseases, and is used for healing, meditation and spiritual development. The site is also used as venue for different cultural events, celebrations and weddings. The stone circle sits in a meadow at the highest point above the village, offering a beautiful view over the surrounding area. From here, you can see not only Holašovice itself, but also the powerful silhouette of one of the most beautiful Czech chateaux, Hluboká Nad Vltavou. Local people and those from neighbouring towns all find this place perfect for relaxation, gentle exercise and rejuvenation.